Fiorenzato UK understands your business can be highly dependent on your coffee equipment and that is why we have a team of specialist engineers ready to take care of any problems should they happen to arise. Fiorenzato UK take pride in offering excellent customer service and aim to provide speedy customer support so we can make sure your coffee equipment is back up and running, in full working order within the least possible time. 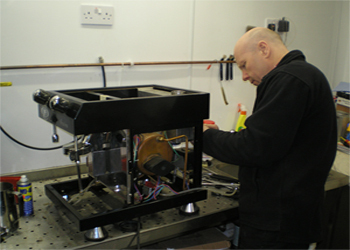 We have our own purpose built workshop where we maintain, repair and test espresso machines. In the unlikely event of your machine not being able to be fixed on site you will be supplied a replacement machine, free of charge to enable you to trade. Fiorenzato UK have a fully stocked parts division to ensure that all espresso machines are repaired, serviced and returned in the least possible time. We realise that our products will eventually need parts and believe in having our own complete inventory and a well trained service department is a necessary support tool for our valued clients. Full De-scale: espresso machine will be stripped of parts, the boiler placed in an acid bath, neautralised, tested and cleaned. If you would like your espresso machine repairing or servicing then do not hesitate to contact us.